Breakfast, the first meal of the day, had to be the healthiest meal during the Soviet era, so that children could go forth suitably fortified and strong enough to be good Communists. Naming the most popular brand of oats for the breakfast porridge ‘Hercules,’ was a good marketing strategy to reiterate the message that a healthy breakfast would make you strong. Breakfast is considered the most important meal of the day, and while there aren’t a huge variety of choices for the morning meal in the Book, most options are very healthy and aimed to give you the energy you need to build a better future. It’s no secret Russian have very set views on health: drafts are almost deadly, drinking cold water gives you colds, sitting on cold stones will cause major trouble for ladies and eating porridge will make you healthy, happy and strong. “Have you not had enough porridge?” my teachers would always ask me if I couldn’t pull a door open, or do something labor-intensive. When I got a bit older I heard another saying related to food and health: “It’s too late to drink Borjomi when your kidneys have failed” or often shortened to just “it’s too late to drink Borjomi,” which means you started worrying about a problem too late. Borjomi is a salty mineral spring water from Georgia and is regarded as the ultimately healthy thing to consume. And as for doctor-prescribed water — there were health retreats called sanatoria by mineral water springs where people would go for a week — or two or four — and take certain treatments, such as drink the local water and do some other “procedures.” These sanatoria were what we would today call ‘all-inclusive spas,” except of course with Soviet service. “You could only go to a sanatorium if you got sent there from work – for free. Those who weren’t so lucky, and there were a lot of those, would just get to the area on their own, rent a house nearby, and would buy a course of mineral water treatment. People would treat their liver, stomach and other organs — and the treatment was very efficient!” Granny remembered. A friend of mine recently went to a sanatorium like that in Jermuk, Armenia – the native land of Anastas Mikoyan, who was instrumental in the creation of the Book. My friend said the experience was a throwback to his Soviet childhood: He was told where to sit, what to eat, what to wear and was given a “patient’s card,” even though he was there for 24 hours. I would love to go and experience that for myself – I wonder if they’ll serve warm milk with the water, too? 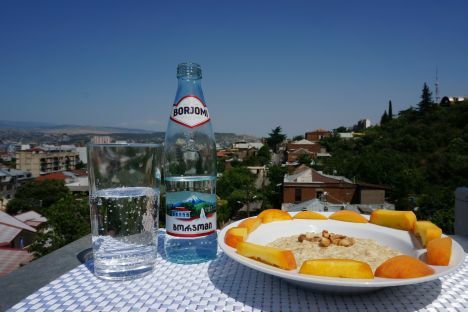 I feel energized and up to anything after the oats and Borjomi Soviet power breakfast! Heat the milk and into hot milk, stir the oatmeal. Stir 10-15 minutes until thick. Put 2 tablespoons butter on the prepared oats.